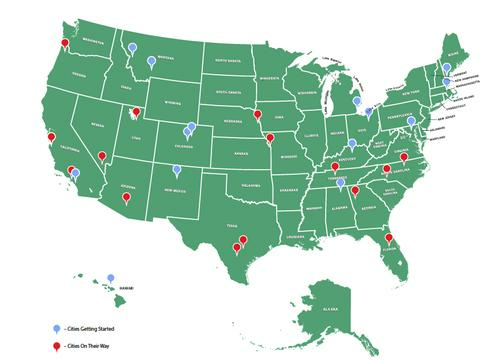 About 30 U.S. cities have launched or are launching municipal broadband networks, according to this graphic from a report published on July 21, 2015. U.S. communities looking for faster broadband service than incumbent ISPs provide have alternatives to the increasingly controversial choice of seeking to publicly fund a network, according to a new handbook for city officials. Public funding of broadband is just one of several possibilities, according to "The Next Generation Connectivity Handbook: a Guide for Community Leaders Seeking Affordable Abundant Bandwidth," released Tuesday by Gig.U, a coalition of universities focused on building high-speed broadband networks, and the Benton Foundation, an advocacy group focused on media and telecom issues. Most city officials say that their local broadband networks aren't good enough in the long term, according to the report, which advises that "the time to begin thinking about faster speeds, more competition and better service is now. Network upgrades do not happen overnight." When Gig.U launched in 2011, "there was no map for communities that wanted to accelerate next-generation network deployment," said Blair Levin, Gig.U's executive director. The new guidelines aim to fill that gap. Close to 30 cities across the U.S. have launched or are launching their own broadband projects, but one size does not fit all, the report said. A handful of cities, including Wilson, North Carolina, and Chattanooga, Tennessee, have built and funded their own networks, but others have taken different approaches. Mesa, Arizona, and Santa Fe, New Mexico, have built networks and leased them to private ISPs, the report noted. Washington, D.C., and St. Louis have built partial networks open to targeted customers, such as businesses and schools. Several cities, including Kansas City, Missouri, and Louisville, Kentucky, have partnered with existing ISPs. Other cities, including San Francisco, Boston and Baltimore, have built Wi-Fi networks that are available in some neighborhoods. Each approach has some benefits and some risks, the report noted. Cities that fund their own networks have local control and can provide universal coverage, but there are risks to the cities' finances and to the long-term sustainability of the broadband networks. City-funded networks also face opposition from incumbent ISPs, the report said. A public and private partnership, on the other hand, subjects the city to little financial risk, the report said. But those networks can have uneven coverage and partnership conflicts can come up over the long term. City-funded broadband networks have run into opposition from incumbent ISPs, free-market advocates and some Republicans in state legislatures and in Congress. Critics argue that tax money shouldn't support networks that compete with private broadband providers. In a handful of cases, municipal broadband projects have run into problems related to long-term funding. City-funded broadband networks are unfair to private ISPs, Randolph May, president of the free-market think-tank the Free State Foundation, wrote in March 2014. "Government systems pose inherent conflicts of interest with private-sector companies attempting to compete by investing tens of millions of dollars in building out new broadband networks," he said. The U.S. Federal Communications Commission stepped into the fray in February, when it voted to overturn large parts of two state laws that limit local governments from funding and building broadband networks. That decision faces potential legal and congressional challenges. Public funding for broadband networks is a legitimate option, said Gig.U's Levin, primary author of the FCC's national broadband plan released in 2010. But communities should decide for themselves what direction to take, he said. "Nearly every community we worked with saw public money as a last resort, when no other options for next generation networks were available," he said. "But our group view was that the decision should be made by the local community." Grant Gross covers technology and telecom policy in the U.S. government for The IDG News Service. Follow Grant on Twitter at GrantGross. Grant's email address is grant_gross@idg.com.